Rugged and heavy duty range of MPP power capacitors for LV application. Compact cylindrical type units from a range of 5kVAR to 30kVAR delivering proven performance with minimum losses, combined with long performance, well suited for APFC applications. Special voltage applications available. The range of MPP capacitors are designed for optimum performance in auto-switched applications in particular and deliver unmatched performance and reliability. 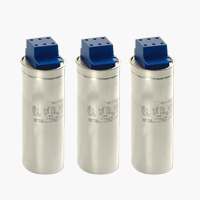 The BELg capacitors are available in heavy-duty configuration to meet upto needs of most APFC applications. The voltage ranges of 415V, 525V and 690V can be ordered based on the need of clients. Company design and easy integration make the BELg the preferred choice of many leading panel integrators using the BELUK regulators.